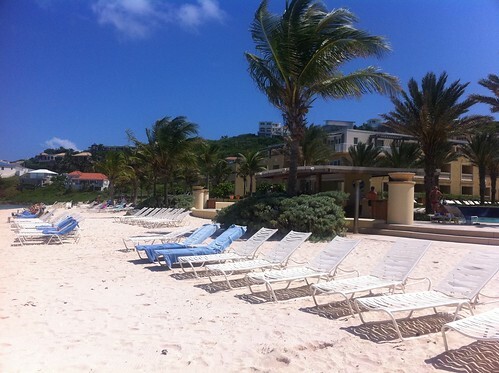 We have just returned from a 10-day vacation, the first three of were spent at the Westin Dawn Beach Resort and Spa on the island of Sint Maarten. The other 7 days were spent a 25-minute ferry ride away on Anguilla. More on that in a later post. We arrived into St. Martin via US Airways through Charlotte. The trip from CLT is just under four hours. Thankfully, we had some frequent flyer tickets in first class. They made all the difference. We arrived in a rain storm, which was the last rain we would see on St. Martin/Sint Maarten, but not the last on our trip overall. We breezed through passport control, but waited over 30 minutes for our bags. As we stood by the carousel, the lost baggage desks were conspicuously over our shoulder. Our bags were nearly the last off the plane, but they made it. Based on some advice on Trip Advisor, we rented a car through Kenny’s. As promised via email, Lesley was there to meet us. He took us over to our white Toyota Corolla in the parking lot, where we did the paperwork. The Corolla will never be confused with a luxury rental. We came to call it the “golf cart” because pressing the gas got you about the same acceleration as would a regular golf cart. This was particularly challenging around the hills near our hotel. That much said, Lesley was very efficient, and the car ($40/day) worked great. Our drive to the hotel through Simpson Bay took forever. The road out of the airport through Simpson Bay is one-lane and very crowded. It moved faster once we got out of that general area and headed up into the hills. Our porter at the Westin later told us that it’s faster to go the other direction, all the way through Marigot and Grand Case. We later traveled through there and now believe him. We got to the Westin fine. If you go (and we do recommend it), beware of the last hill to the hotel. The hotel is at the bottom of the steepest hill down which I’ve ever driven. It’s worse than anything I’ve seen in San Francisco. The roads on the island go up and down as the landscape does, and we were constantly challenged to see over the hill at oncoming traffic. Check-in went well. We asked about an upgrade to oceanfront and were told it was available for $100 per night. 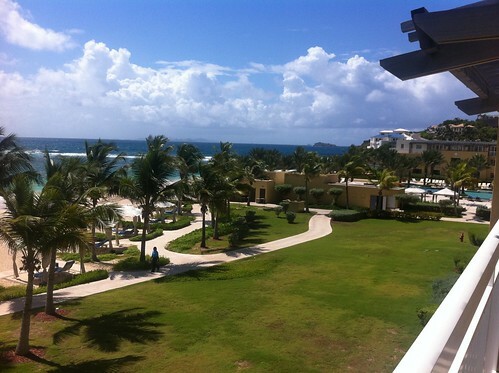 Knowing we were headed to Anguilla with an oceanfront room reserved there, we passed. After checking-in, I parked the car in the free garage, and we headed up. To our dismay (and the porter’s), our room had not yet been cleaned. That was frustrating to say the least. He was really embarrassed. The hotel found us a room relatively quickly, and we got our oceanfront room for free! I’ll give the hotel credit for recovering nicely. The room was standard. King size bed and a sitting chair. A desk with wired and wireless Internet. Cable TV. Separate shower and tub. Oddly, our sink was cracked, something Mrs. Spidey thought had to happen upon installation. Internet was $14.95 per day per device. We plugged in Mrs. Spidey’s laptop, but elected not to use wireless for our iPhones and my iPad. The pool and beach area was quite nice. The hotel is tucked into a little cove on Dawn Beach near Oyster Pond and is unreachable, except through the hotel. That made it very quiet. We had no trouble finding lounge chairs on the beach. Towels were readily available, and waitresses came by to take drink orders. The water was warm in both pool and ocean, and the ocean wasn’t too rough. Granted, this was low season, but the quiet and serenity was quite nice. We could envision it more noisy at Easter or Christmas, but even then, the beach was long-enough and secluded enough to find a good spot. There is a casino (a very, very small casino) just off the lobby in the hotel. Although it seemed like some tourists went to the hotel just to gamble, it was never crowded. We probably lost $100 on slots between the two of us, in the three days we were there. We were on the island for three dinners and three breakfasts. We had one breakfast and all dinners outside the hotel. The hotel has a breakfast buffet in its restaurant that was around $25 per person. It had made-to-order omelets, french toast, cereals, sweets, and lox and bagels. Our breakfast outside the hotel was at Mr. Busby’s, which was just back over the hill behind the Coral Beach Club. It was about $25 for the two of us for breakfast right on the beach. The breakfast was the quality of any diner I’ve been to back the U.S. – very sufficient. The view, however, was fantastic. Our first dinner, the night we arrived, was also in Coral Beach Club at Big Fish. It was very elegant and is recommended. We sat outside on a deck, but there is no view, as it is inside a courtyard. We ate well, although the service was a bit slow. We learned over the next 10 days that the speed at restaurants on both islands is much, much slower than at home. We never really got used to it, but we were accepting. Mrs. Spidey had a dish called Oprah’s Favorite, which was a mixture of different types of seafood. I had a Mahi Mahi dish that was stuffed with crabmeat and covered with lobster sauce. Both were served on incredibly large plates, each with four small sides. We would go back, although we’d be a bit hungrier next time. We were stuffed. Our second dinner was at a café in Marigot. (IMPORTANT NOTE – Marigot basically shuts down on Sundays. We were lucky to find anything open. When I write that it was a ghost town, I mean it.) Unfortunately, neither of us can remember the name of the restaurant in Marigot, but it was right in a strip of four outdoor restaurants to the left of the ferry terminal, as you face it. The food wasn’t to die for, but was enjoyable. I had the curried conch, and Mrs. Spidey had some coconut shrimp. Our last dinner, before heading to Anguilla, was in Grand Case. If you are in St. Martin, you must got eat in Grand Case. It is a town of perhaps 3/4 mile in length, but much of it is a one-way strip of Grand Case Boulevard, on which there must be 10 or more restaurants. The proprietors/chefs of the restaurants stand outside beckoning you in. Armed with the Trip Advisor rankings, we chose La Villa for dinner. We were not disappointed. The restaurant offers the first drink free and (if you think ahead) will convert 1 Euro for 1 USD, if you pay in cash. I had an escargot appetizer that was as buttery as one could want. I also had a filet that was cooked very nicely, also with four sides, just like The Big Fish. I wish I could tell you the rest of the meal, but I just can never remember what I eat unless I write it down right away. 1. Definitely rent a car. The island is not that big, and renting a car gives you the flexibility you want. Kenny’s worked well for us. 2. Get out of your hotel for meals. Mrs. Spidey told me that Grand Case is considered the culinary center of the Caribbean. I now believe her. We didn’t even stop at any of the outdoor barbecues. Enjoy it. 3. If you want to shop, synchronize your shopping in Marigot or Phillipsburg with the cruise ships. We did neither and didn’t enter a single store. Plus, the stores close at 6:00pm. You need to leave the beach early. 4. Although we didn’t see rain for our three days, rain is prevalent in the low season. However, it never seems to last very long. I think we would go back to Sint Maarten or St. Martin, but, if you read my next post, you’ll see that we’re more likely to return to Anguilla. 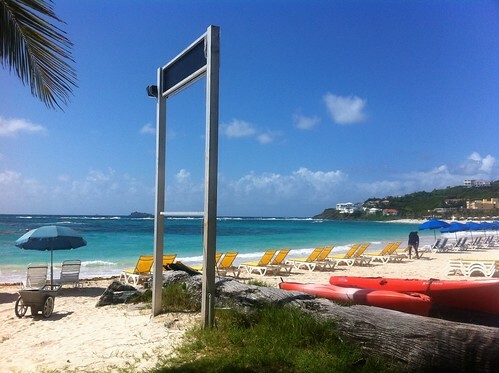 You say that the airport is on the French side (St Martin). However, I assume that you arrived at Princess Juliana International Airport, code SXM, which is well and truly on the Dutch side (St Maarten). Easy to remember: the Netherlands is located North of France, with Belgium in the middle. Thus it makes sense that the French part of the island is the Northern half of the island, and the Dutch part the Southern half, with nothing in the middle (barely a border marker to be precise). There is an airport on the French side (Grand Case), but that is a much smaller one than SXM. Thanks for pointing that out. I thought the border went on the other side of the airport. Post is now updated thanks to Pieter.